What a way to end a tour! For us the day started with a wander across Nottingham from our hotel to Annie’s Burger Shack and Freehouse. As Matt has recently turned 40 celebration was very much the order of the day – and appropriately around forty of us piled into the basement bar thanks to Dave and Nadine’s organisational skills for a few beers and some epic burgers served up in a buffet style, so whilst you don’t quite get the extravagance of the restaurant offering, boy do you get a superb plate full of scran! It was great to see Matt’s family and friends mingling with the gig-going types and having an awesome time – probably the most amusing bit of proceedings for me was daring the two Daves into eating the scotch bonnet I’d bravely picked up then cowardlyly deciding not to eat – it’s fair to say that one of the Daves clearly has a higher spice threshold than t’other! With plates cleared there was time for some cake cutting (an epic violin-shaped creation!) and Happy Birthday singing before we started to make our way gig-ward. By the council house we bumped into Lee doing promotion for EM-Con complete with a dalek, a quick catch up and we wandered up to The Tap n Tumbler, where we found a few early starters – with more arriving all the time. The jukebox got a bit of hammer – probably a decided step to the strange for any regular pub goers there expecting a decidedly more rock-based playlist! It was great to catch up with the folks who’d not been around the rest of the weekend – I’m not gonna start listing ’em, I’ll miss some out, haha! Ah, day two. Groundhog night? Not a bit of it really. This time the evening started in a hotel, waiting for Ella’s train to get in – once we’d got ourselves checked in and sorted we nipped up to the marvellous Tap and Tumbler for a few drinks and general catching up with folk. 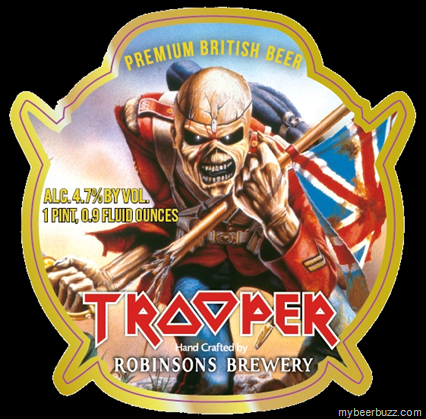 There was a nice atmosphere about the place, and I finally succumbed to the temptation I always have in there to buy a pint of Trooper – Iron Maiden produced beer, and very nice it was too. With plenty of folk on hand to talk to, it was a splendid way to start the night. Better still, who should be stood next to me at the bar but Cliff – who I mentioned yesterday. I’ve literally not seen him for a good many years, and it was absolutely fantastic to get the chance for a prolonged natter at the bar. Reminiscing, putting the world to rights and occasional introductions – it was great. As I mentioned in yesterday’s blog (which gave me my record views in a day since the blog’s inception – thank you!) Cliff tutored me through firewalking and glasswalking back in the day – both amazing experiences on different ends of the adrenaline scale. The only pitfall was as time did its inevitable thing we realised we’d propped the bar up and talked our way through the support slot of Louise Distras which is very remiss of me, my humblest apologies to her. In the venue we headed up to the balcony, Ella was planning on taking in the gig from on high – whilst unlike yesterday I was planning on getting smashed around the moshpit for an hour and a half. Which gave Ella dual duties of set list noting and carrying my assorted breakables. So it’s thanks to her that I have the song order, haha! The world turned upside down..
Ah, it’s good to be back writing about Ferocious Dog for a change! Upon arriving at the Rescue Rooms with Jamie and Teresa to find Ken holding court outside. A gentle chide about my rather less than impressive attendance record was followed up with a big grin – he was clearly really excited about playing the first of three sold out nights on home turf. With a full on day I’d arrived straight at the venue, with another today I’d opted to drive, saving Friday and Saturday for alcohol opportunities. So I wandered straight into the venue – in addition to the Ferocious Dog banner, on equal billing was one depicting Kurtis Mann, a fellow fan of the band who lost his life last year, a lovely touch. It was emblazed with The Kurtis Mann Stage. Sadly I never got to knew him although must’ve bumped into him at countless gigs – in a small world moment I do actually know his dad from pre-Ferocious Dogging days, I’m looking forward to catching up with Cliff over the next couple of evenings – it’s been a long time since he guided me to walking on hot coals, broken glass and breaking boards with my hand! They’re so pretty, oh so pretty.. 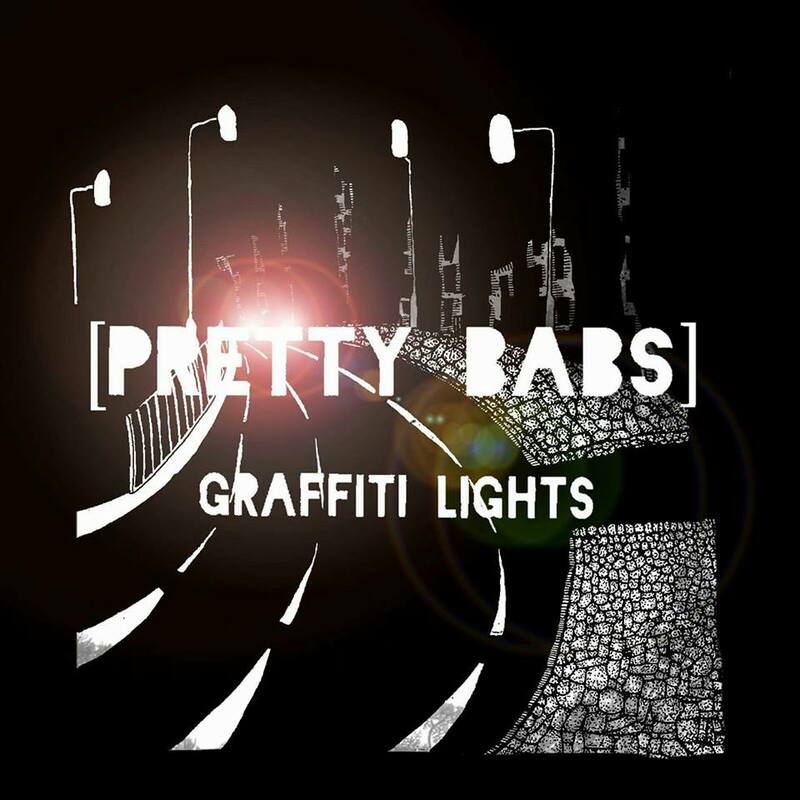 Pretty Babs seem to have appeared on the scene pretty damn suddenly – and bam, they have an album pretty much ready to drop. It’s true that they appeared made up of people that I was already very familiar with – Sam Jones on guitar and lead vocals has appeared on these pages loads, and Liam Bainbridge of course played bass in his self-named band (and I’m sure featured with Brad Dear at some point pre-blog days) – and on drums there’s Brad Drury, of course formerly of Ferocious Dog and occasional Star Botherer. So familiar faces in a slightly less familiar setting. 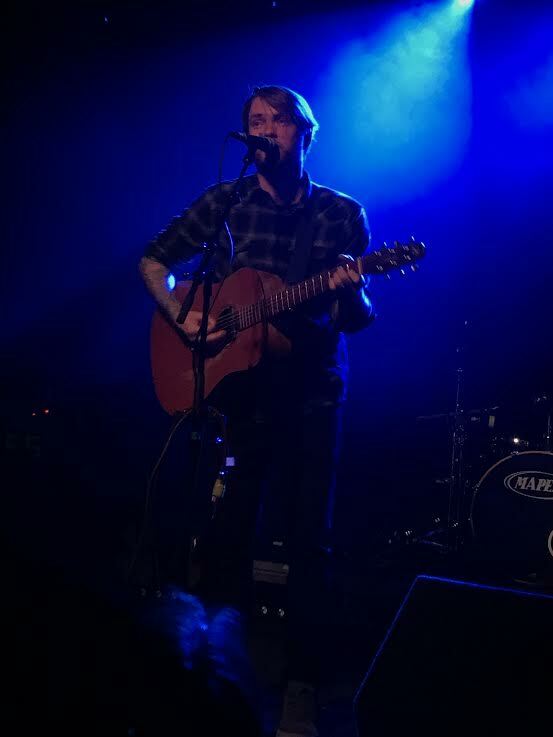 The thing that struck me when I first saw Pretty Babs live was that Sam’s powerful voice has been absolutely crying out for a heavier backing track than he formerly had – either just with his acoustic guitar or band. So taking a step back from the folkier bluesier sound and getting down and dirty with some more grungy rock has been a revelation – so obvious, but it’s easy to say that with hindsight. They’ve clicked though, and landed on a sound that is both engaging and, dare I say, has the potential to be commercially successful too (like I know anything about that, ha!). So, Graffiti Lights is their debut album – complete with artwork by The Famous Artist Birdy Rose, and I’ve been getting to grips with it for longer than I ought to have before getting this written down. I was going to drop Sam a message and ask why on earth they plumped for Pretty Babs as a name, but decided against it – I really have absolutely no idea! It’s certainly catchy though – it always makes me smile as the canteen ladies at my office in Solihull always call me ‘Bab’ when they hand me a tea or coffee – I think that the Solihull canteen ladies would probably surmise that Sam, Liam and Brad are indeed pretty babs. So maybe that’s it. 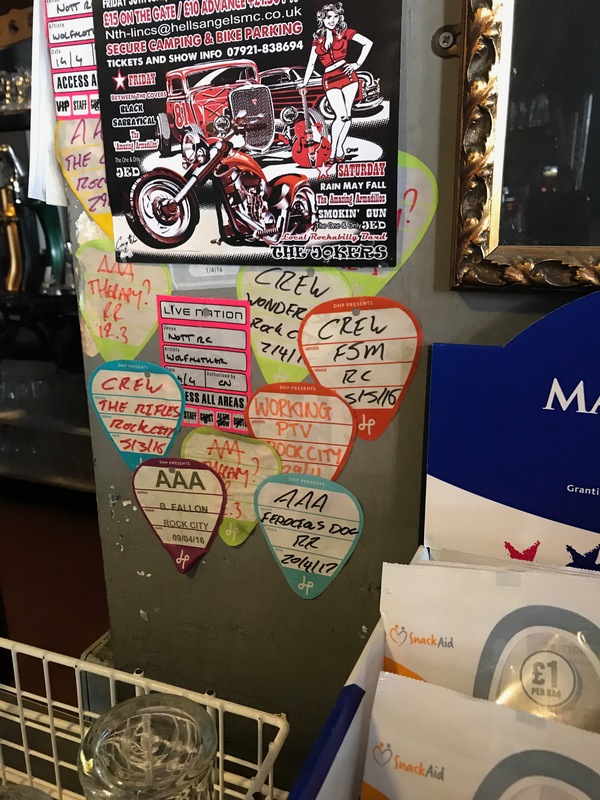 Saturday started for many of us with reminders to get online for noon when Ferocious Dog tickets for the Red Album intimate gig ticket link going live. Dan always gets a hard time for lateness, sometimes a little unfairly, he was bang on time on this occasion – alas, so were the technical gremlins at Alt Tickets meaning lots of F5 pressing was going on around the country. 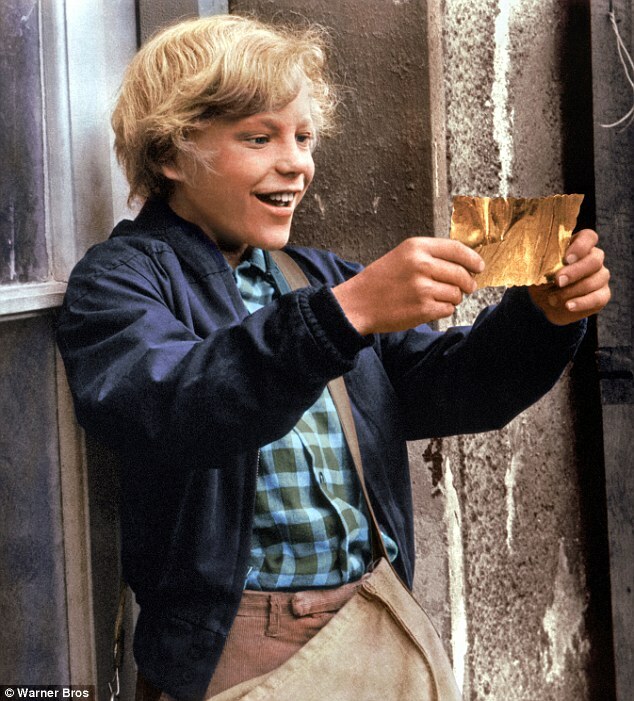 After a bit of waiting the new link went live and I’m happy to say I snagged a couple of tickets. It would be a bit rubbish if I wasn’t able to write about the first airing of their new album material after all – so very much a relief! Then it was a day of chilling – for the second time this year there was going to be a gig that was easily taxiable from home! 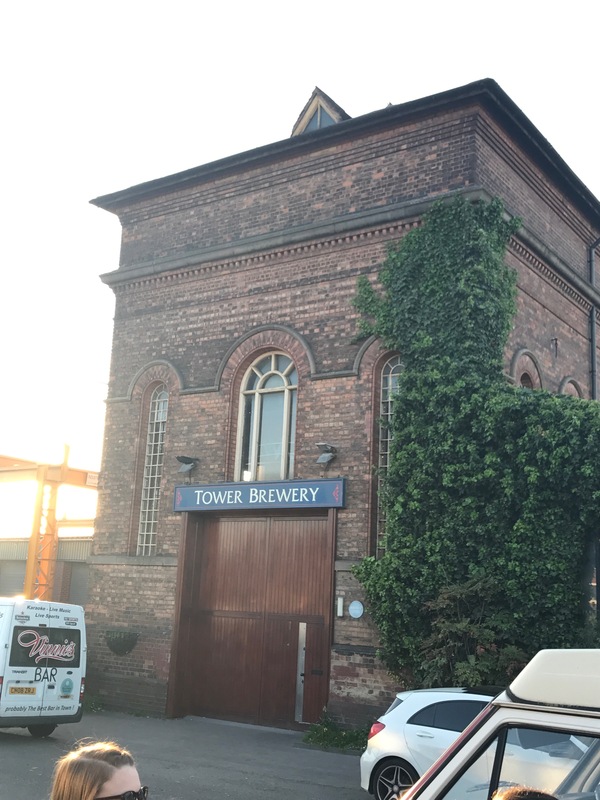 Indeed, had the day gone fully to plan then Simon would’ve given us a lift but unfortunately couldn’t make it up to stay, so I booked a taxi and loafed – Becki arrived, we had pizza and honey rum and coke and eventually hopped in a cab to Tower Brewery in Burton on Trent down the road. Upon arrival soundchecking was going on – but outside Dave, Caroline and Murphy had already set up camp outside – with Russ and Michelle arriving shortly after we took advantage of the sunshine and sat outside enjoying a drink or two and a catch up. Heaven knows what the passing motorists must’ve thought as we sat there. Gradually as more and more folk arrived we headed into the venue – it’s a great venue, a high stage by the front, a bar at the back, some seating, a balcony and an irresistible spiral staircase makes for some interesting photo angles! Everyone loves a Funke Friday! I’ve been looking forward to the first Funke headline show I’ve been to, I think. Bodega in Nottingham was the venue, with another night out on Saturday I opted for driving rather than working out a way of making it a drinkable trip – so we picked up Jamie and Teresa en route and headed to beautiful downtown Nottingham and got to the venue for a drink or two downstairs before the venue was open. 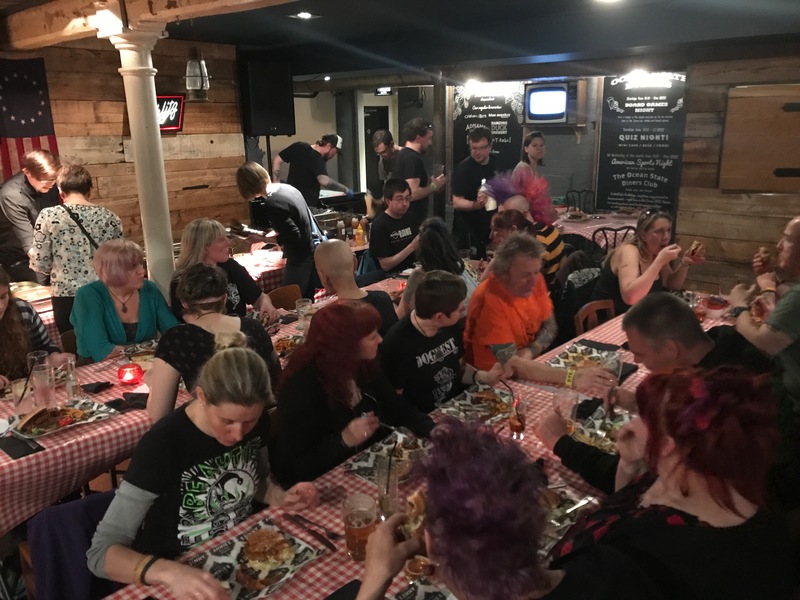 Plenty of familiar faces were amassing (and an impressive collection of Brian Stone t-shirts, clearly some of us need to have a quick wardrobe-plan conversation before we head out to a gig!). First up was local act Motormouf who I’m aware of but had never seen before – and wow, was he impressive! 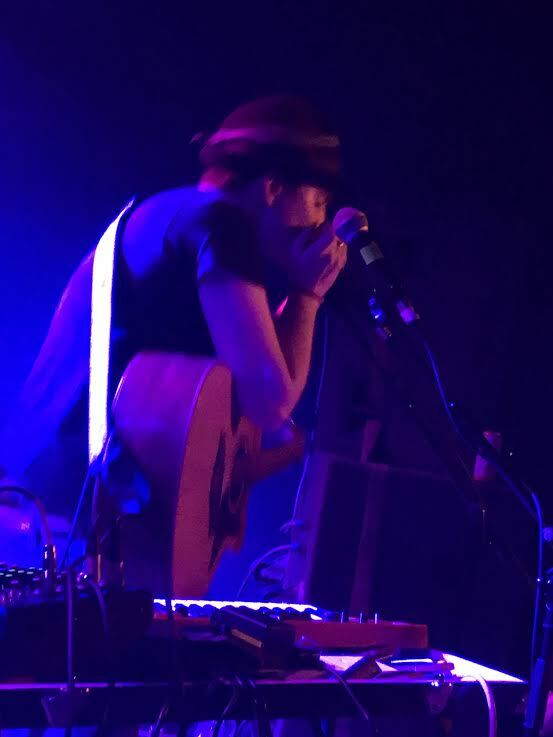 He unassumedly got himself on stage and straight into it combining a soundcheck with the start of his set. Highly compatible with Funke in that he was using loops and a sampler – but it was pretty much all vocal beatboxing (possibly with some other samples thrown in) – overlaid with hip hop vocals, thoughful rapping and clever lyrics, and an amazing stage presence with plenty of movement and eye-contact for the crowd. I was really rather taken with him – in terms of track names, well I didn’t do very well on that score – What You Waiting For? 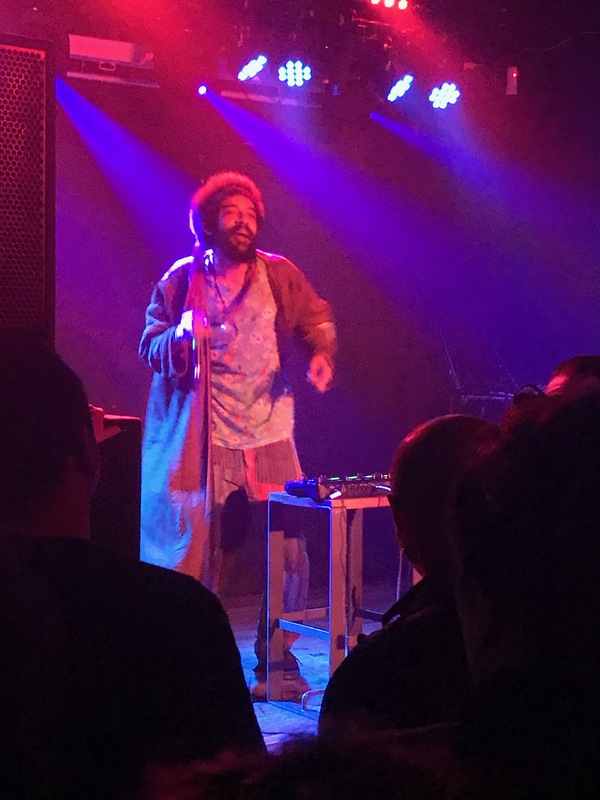 was second track in I think, and he finished up an all-too-short set with a cracking interpretation of Earth Wind and Fire’s It’s Alright. He had to dash as he’d inadvertently double-booked himself so needed to get up to The Maze for another gig minutes later (good luck with that! ), but definitely a good support act moment, someone I’d love to hear more from, and shall make sure that I do that very thing! Who put the crown on the head of the clown? 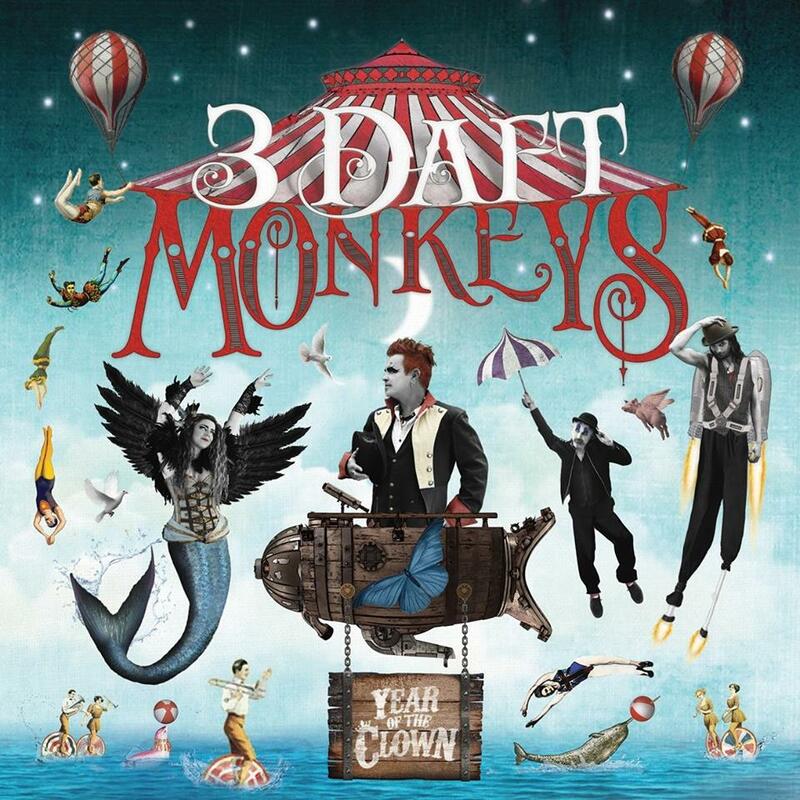 I do bloody love 3 Daft Monkeys, there’s no denying it. They’re playful yet poignant, irreverent but relevant, mischievous and mystical – they weave and fuse their modern folk sound with celtic and balkan type influences – they bring smiles, they bring tears. It was a real honour to be sent a preview copy of their new album – The Year of the Clown. I’m always touched to be asked to review something somebody has created, it’s a personal thing and I’m only too eager to make sure that I treat it with the respect it deserves. The CD arrived whilst I was galavanting at Rockstock and Barrel – I excitedly put it in the car when going to take Ella back to Stevenage only to be greeted with the dreaded ‘disc error’ message – oh well, I’ll rip it when I get home, I thought. And I did – but only nine of the twelve tracks copied successfully… modern technology is great though, a quick email and Tim kindly furnished me with digital copies of the remaining tracks which I’ve spent the last few days getting to know whilst commuting, doing chores and well, basically any time I’ve been listening to music. Accompanying the disc is a press release – Year of the Clown is a deliberate reference to the frankly terrifying global political stage – it positions the album as being very personal, 3 Daft Monkeys exposing their bare bones and their souls. It shows in the sound too – in typical style there are powerful observations masked by catchy melodies, mischievous rhyming devices and swirling soaring fiddle journeys. It’s unmistakably 3 Daft Monkeys, but with a degree of themeatic reinvention we’ve seen in their last few albums – and going another step toward trying to capture their raw live energy on a recording. Saturday morning came with no particular hangover, the joys of Scrumptiddly Cider and pacing yourself! With the morning likely to be taken up with wedding preparations, as Dave and Caroline were being handfasted early in the afternoon, and with The Star Copiers having a set mid-afternoon I was more interested in acquiring some breakfast and tea than thinking about getting on the cider. 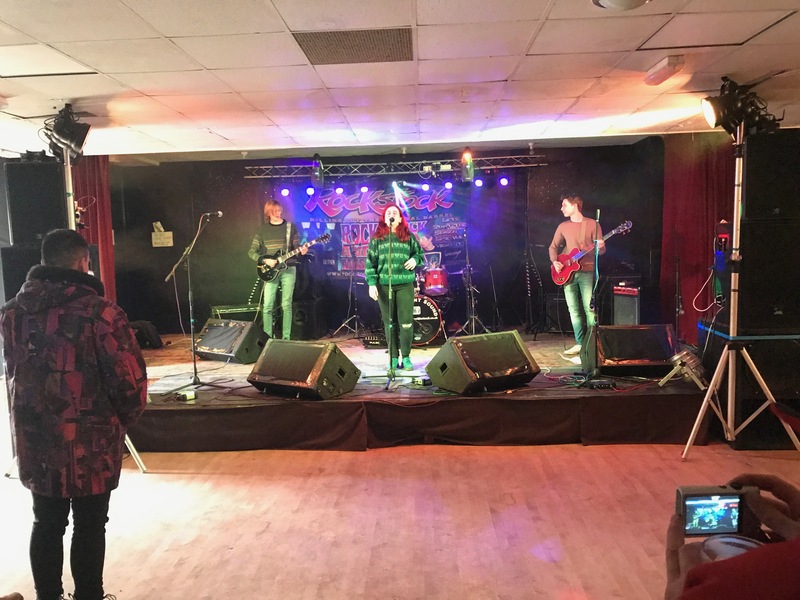 We did find time to pop into the main room to see Phily’s daughter and her band open up the day with some ace indie rock to blow the cobwebs away. I’m going to try to remember that I think they were called The Hatters – I’m really sorry, that’s pretty bad not even getting a name written down! I was dipping in and out of the set trying to track down the sword I needed for the ceremony shortly, but one song was dedicated to a dead fish called Speedy (I think! ), and there was a rousing rendition of Chelsea Dagger to enjoy too. It was a shame not to have seen more of the set but my principle duty until he was handtied was to protect Dave, so I set out to find him. 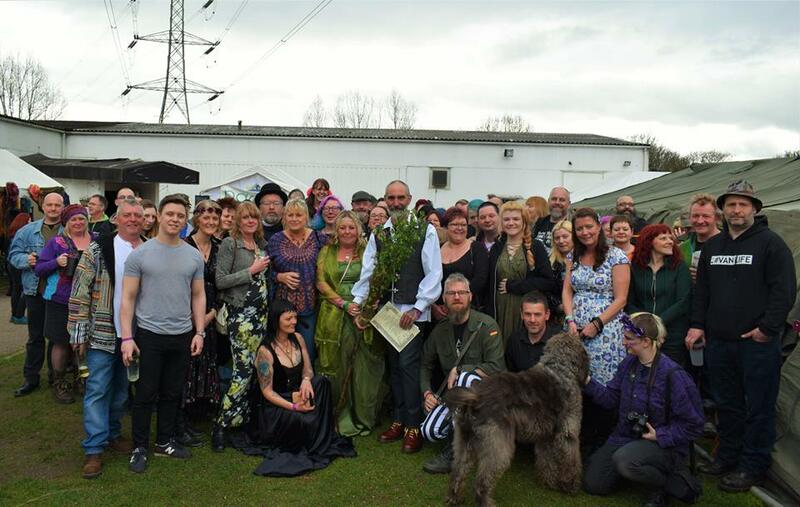 Eventually guests were ushered into the acoustic room which had been set up to perform a handfasting ceremony – which Tina expertly guided them through. Siobhan and I were witnesses – along with the rest of the room. It was a really quite moving, I’ve never really experienced a handfasting before. I was sorry to have to give up the sword to Dave though, I must admit! The indoor ceremony was concluded with the sharing of mead from a drinking horn, whilst outside bird seed was scattered and the happy couple jumped a broomstick held by the witnesses. A beautiful way to start the day. One hell of a bar has been set as the festival season commenced this weekend, for Ella and I it started on Thursday evening for Jonny’s EP Launch. After finishing up at work Ella got a train in to Solihull and we headed off to grab last minute stuff from home and jump into Ludo to take the short drive up to The Chimneys in Willington for Rockstock and Barrel. On a normal day it’s a nice-but-functual former industrial social club site – when Debbo, Phily and the team get their hands on it they turn it into a magical festival wonderland. Â We got ourselves parked up in a handy spot, and set to the quick job of getting the van sorted as our accomodation for the next few nights. The Cheezy Vinyl Bar and The Scrumptiddly Cider Bar were set up outside, the former also housing a Murphy’s Stage giving a third performance space at the festival. Inside the main hall housed the main stage area, the acoustic stage moved into the former snooker room which had – predictably – had a Rockstock and Barrel makeover to create a wonderful intimate space. Friday morning started with helping John move his tent – then a stint covering the gate to the Riverside campsite for just under a couple of hours. It was quite nice to just watch the world go by and guide in a few early arrivals to their camping spots. 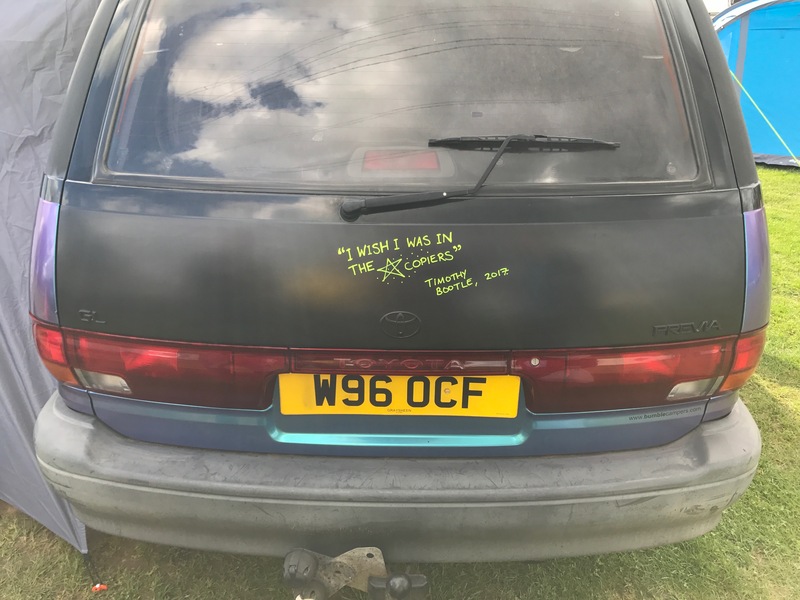 Then it was time to loiter around the Chimneys campsite as people started to rouse or arrive – a quick walk to Willington for supplies passed some more time, and a chance to ‘vandalise’ Tim and Jo’s new van, Tootle (it has a blackboard-paint covered boot lid and they had chalk pens for us to use). We were pretty restrained I think, it will be interesting to see how it fairs over the course of the festival season! Soon enough though it was time for the music to start. I’ll make no apology for doing lots of dipping in and out of things and not making detailed notes – but hopefully I can still do the weekend some kind of justice! I’m going to tackle Jonny Wallis’ EP launch night as a separate blog post I think – because well, an EP launch is a big deal and whilst he utilised the night-before-Rockstock to use the same venue, it was a separate and significant event in its own right, so should be treated as such in blog terms I think! We’d arrived on site early evening near enough straight from work for me via a quick trip home to get changed, packed and a quick vehicle change – so by the time the music was starting we’d already been having a great time! With a few folk already on site (and clearly had been for a while!) we were summoned over to Ian and Lynne’s van (Eleanor) for an impromptu jam – with Jamie in attendance it wasn’t long before tequila slammers were produced. All in all, a thoroughly lovely way to ease into the evening – this wasn’t technically part of the festival, but an EP release night for the excellent Jonny Wallis – he’d got Stevie Simpson and Brian Stone to provide support slots for what promised to be a splendid warm-up for the festival proper. 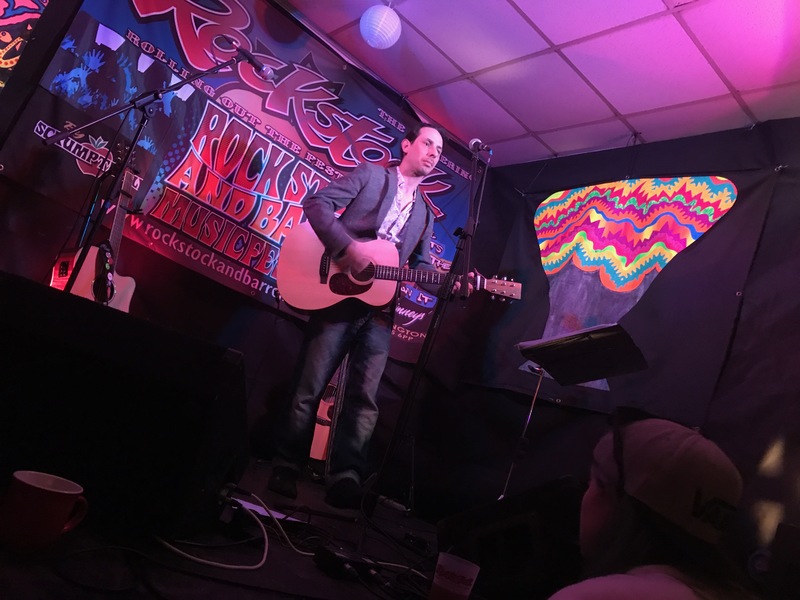 Rather than have an outdoor/tented acoustic stage for the festival this year, the recently cleared former snooker room had been appropriated and used to create an amazing intimate space. This was where Jonny’s launch was taking place, from our point of view in The Star Copiers it was of intense interest to us too as we would be playing in there on the Saturday night, a great space and it was great to see plenty of people had managed to get to the site early in order to support the launch and enjoy a bonus night of excellent entertainment.